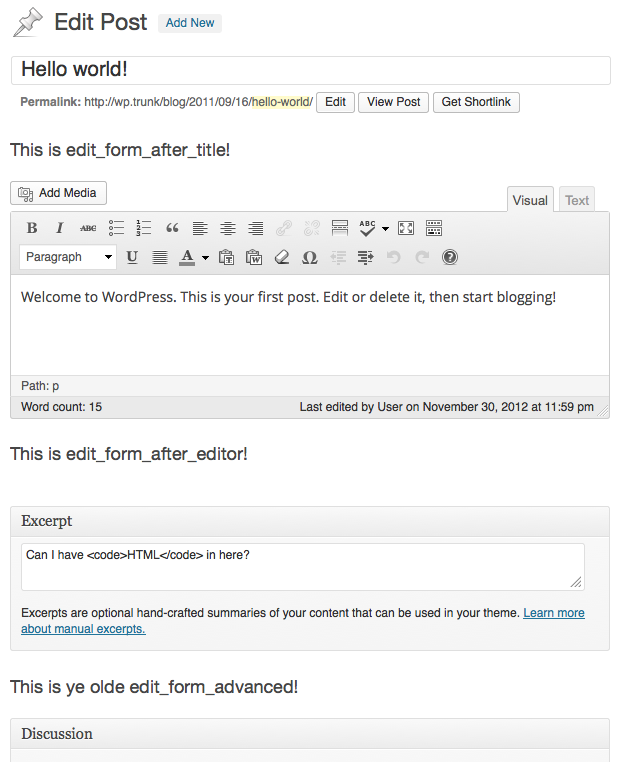 In 3.5, we’ve introduced two new hooks for the add/edit post screen: edit_form_after_title and edit_form_after_editor. Previously, there was the edit_form_advanced hook (or edit_page_form for pages), which appeared between the normal and advanced sections of metaboxes below the editor. Now you’ll be able to use edit_form_after_title and edit_form_after_editor, both of which are available even if the post type doesn’t support the title or editor. While lots of things are appropriate in the various metabox areas, sometimes your customizations to the screen might need to go elsewhere. TinyMCE is a prime example, as it doesn’t like being moved in the DOM, such as in a draggable metabox. Core itself is now using edit_form_after_title on attachment editing to display the image and some fields for editing. This is great. I was looking for ‘edit_form_after_title’ as a requirement. Now I can do this using this hook. Great. Good stuff! Thanks a lot for sharing this! Not… quite so sure what to make of this… is it meant just for static text or will I be able to interact with the poster/pager helping them further customize the theme? Most of the screen is a form, including the locations of those hooks, so you can add form elements and they will be sent with the $_POST data when you save/publish/update a post. You’d handle that the same way you’d handle data from a typical metabox, using the save_post action with appropriate checks and validation/sanitization.